Elevation montages show the facade of a street by assembling photos of individual buildings. They can be useful for helping people gain an understanding of the building fabric and devise improvements. An elevation of a street is created by assembling a series of individual photographs. Both sides of a street can be done and pasted either side of a plan. Simple instructions ask people to make comments on Post-it notes or cards and place them underneath the relevant section (what they like/don't like/would like to see). 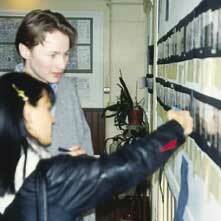 The build up of Post-it notes or cards generates a dialogue amongst participants and useful data for later discussion and analysis. Kingswood, UK, 1996, Roger Evans Associates. Photomontages as part of a workshop aimed at generating urban design proposals. Table-mounted displays make it possible to have both sides of a street opposite each other on a plan. Wall mounted displays only work if it does not matter treating both sides separately. Useful debates can take place around the exhibit. Keep a notepad or sound recorder handy. Very useful as an ice-breaker at the beginning of a workshop, and as a visual prompt for all participants during a workshop. Also useful as part of an open house event. Main costs: Film processing and purchase. Preparation time (2 person days). Stand the same distance from the building line when taking all photos unless there are setbacks in the buildings, when you should move closer. If relating to a plan, then it is best to mount the montage on a long table. If on a wall, then one elevation will be upside down. Digital mapping which can be re-scaled is useful for adjusting the plan to fit the elevation. The plan is more understandable if photos are placed directly on the building line. Elevations are more understandable if photos are stuck together so that shop signs are readable even if there is some mismatch at roof level. Helps participants and design professionals gain a visual understanding of the environment they are dealing with. Secures the views of people lacking the confidence to speak in group discussions. 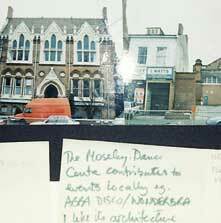 Can be left as part of an unmanned exhibition over a period of time. Can be costly to prepare and may not be cost-effective compared with other methods. 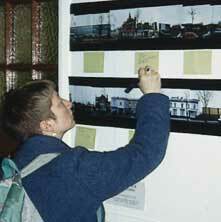 Residents pasting Post-it notes on a wall-mounted montage. Birmingham, UK, 1994, Nick Wates. Thanks: Julie Withers, Kathryn Anderson, Roger Evans Associates.